Angie Hood grew up in a remote valley tucked along the edge of the Navajo Nation. On hot summer days, Hood and her three siblings would tend to the family’s sheep, play football in a steep-banked arroyo and explore the piñon-studded mesas. Then, to cool off, they would splash in a pool of water that streamed from a pipe. At the time, the Hood children had no idea they were playing in radioactive waste. Dangerous remnants of the region’s Cold War boom, more than 500 uranium mines were abandoned on and near the Navajo reservation, now home to about 175,000 people. Thousands of families like Hood’s unwittingly used water from contaminated wells and springs to drink, bathe, hydrate their livestock and irrigate their gardens. In some cases, people built homes from construction materials tainted with mine and mill wastes. New scientific evidence has emerged that suggests the severity of the Navajos’ exposure: Uranium has been found in the dust in 85 percent of sampled homes, and everyone tested, even the babies, has uranium in their bodies, with some carrying concentrations far above the U.S. average. The Navajo Nation and the U.S. Environmental Protection Agency have worked for more than two decades to address some of the most glaring hazards at the mines. But now the Trump administration is proposing deep budget cuts that could hamper these cleanups. EPA Administrator Scott Pruitt has proposed a 30 percent reduction in grants to fund tribes’ environmental protection, a 20 percent cut in overall EPA staffing and a 30 percent cut to the Superfund program, which identifies polluters and obligates them to fund cleanup of the nation’s most toxic sites, including the Navajo mines. Congress is moving toward less substantial budget cuts as the appropriations process begins. But the EPA is already shrinking its workforce with buyouts and early retirement offers that will eliminate more than 1,200 positions by September. Navajo Nation President Russell Begaye is worried that the cuts could derail the EPA’s efforts to identify the companies responsible for the mine cleanups, supervise the projects and provide new housing for residents when necessary. The tribe also receives annual funding from the EPA — $16 million last year — for the tribe’s environmental programs, such as enforcement of air pollution rules and water quality projects. So far only one abandoned uranium mine out of 523 has been cleaned up, and the cost of tackling the rest is expected to reach several billion dollars, Begaye said. Even if the funding remains at the level of the Obama administration, it would take decades to complete the work. Last year, Hood, 36, along with her parents, two daughters and three siblings, left their ancestral land known as Red Water Pond Road, worried about their health. Leaving was painful; the land holds seven generations of her family’s prayers, stories and environmental knowledge. More than 100 members of her extended family still live in the shadow of one of the nation’s most complex hazardous waste sites. Hood’s mind often flashes back to the days when she splashed in contaminated water and played atop enormous mounds of uranium tailings just a few hundred feet from her home. Could this have contributed to her thyroid disease? What about her daughter’s asthma, her grandfather’s lung disease and her aunt’s cancer? 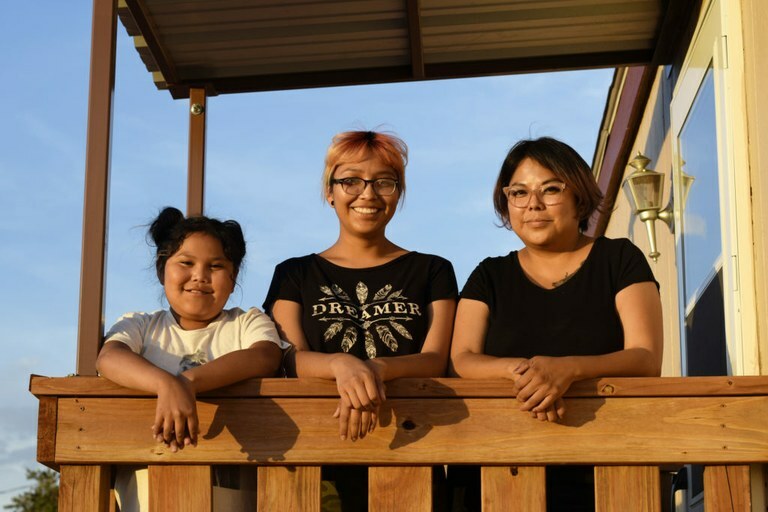 Angie Hood, right, and her daughters, Nola, 9, and Desiree, 15, moved to a manufactured home in New Mexico several miles from the Red Water Pond Road community on the Navajo Nation where Angie grew up. The community remains contaminated with uranium from decades-old abandoned mines, so Hood reluctantly left to protect her children’s health. Fueled by the U.S. government’s nuclear weapons program and later nuclear power generators, the uranium industry thrived in the Southwest between World War II and the early 1980s. Church Rock — 6 miles east of Gallup, New Mexico, along old Route 66 — became one of several centers of uranium mining and milling across the Navajo reservation, which is the size of West Virginia. The industry mined millions of tons of the ore here between 1944 and 1986, according to the EPA. Until the late 1960s, the U.S. government was its sole customer. As a child in the 1950s, Hood’s father, Tony, witnessed the arrival of the mining companies to conduct exploratory drilling around his home. No one in his family understood what radioactivity meant, and no one from the government or the mining companies bothered to fill them in. In 1979, Church Rock became the site of one of the worst nuclear accidents in U.S. history when an earthen dam at the United Nuclear Corporation uranium processing mill gave way a mile downstream from Red Water Pond Road. About 1,100 tons of uranium tailings and 94 million gallons of wastewater containing high levels of radioactivity and heavy metals poured into an arroyo used by Navajos for livestock grazing and irrigation. As the uranium market plummeted in the 1980s, companies abandoned the mines and mills. They left behind more than 1,000 unsealed pits, tunnels, mine entrances, tailings ponds and waste piles containing highly radioactive materials and toxic chemicals that eroded and leached. When the EPA and tribal environmental officials began inventorying the mines in 1994, a picture of widespread contamination emerged. Nearly 13 percent of the unregulated drinking water wells, springs and storage tanks tested on the Navajo Nation contain uranium levels exceeding the national drinking water standard, according to one recent study. The House Committee on Oversight and Government Reform told the EPA a decade ago to collaborate with the tribe and four other federal agencies on a plan to tackle dozens of sites that posed the highest health risk. But even the highest priority cleanup — a United Nuclear Corp. mine now owned by General Electric that is next to the Red Water Pond Road community — is still years from completion. The U.S. and General Electric are sharing the cleanup costs. The EPA has reached agreements with 10 companies to address 213 mines, including a $985 million settlement with Anadarko Petroleum Corp. for 50 former Kerr-McGee mines and a $600 million settlement with two Freeport-McMoRan subsidiaries for 94 mines. In addition, the federal government has provided funds to start work on 16 orphan mines for which no responsible party has been determined. But altogether, these funds will cover cleanup at fewer than half of the Navajo Nation’s abandoned mines. “There’s quite a lot of money available to start addressing the problem, but much more money is needed to fully address the Navajo uranium legacy,” said Chris Shuey, director of the Uranium Impact Assessment Program at the Southwest Research and Information Center. At Red Water Pond Road, residents wonder if the mines are at fault for their illnesses. Edith Hood, Angie Hood’s aunt, was diagnosed with lymphoma, a cancer of the immune system, in 2006; she is now in remission. “There seems to be at least one from each household – thyroid, respiratory and kidney problems, cancer,” said Edith Hood, who has lived nearly all her 66 years there and once worked in the mines. By the early 1950s, federal researchers had linked radiation exposure to lung cancer among the region’s uranium miners. A later study found that about two-thirds of Navajo men who had lung cancer between 1969 and 1993 were former uranium miners. As a child in the 1950s, Tony Hood witnessed the arrival of mining companies to conduct exploratory drilling for uranium around his community, without warnings about radioactivity. 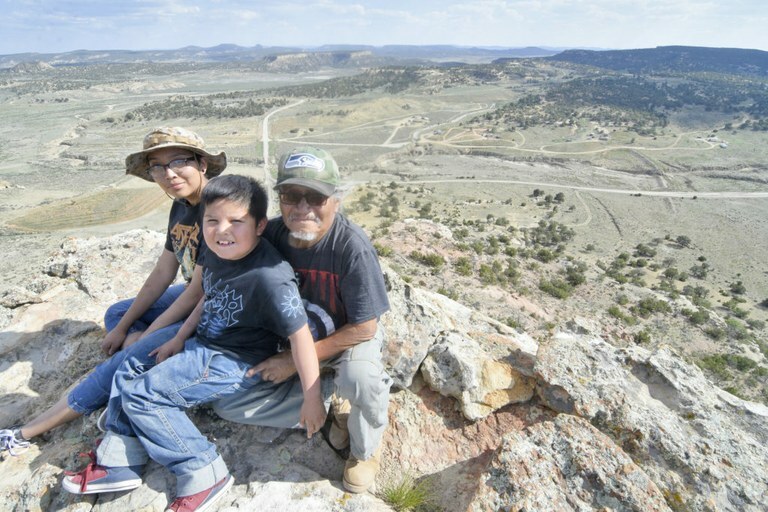 Now health researchers have found uranium exposure to be widespread among the Navajo, so Hood worries about his grandchildren, including Desiree Smith, 15, and Damien Hood, 8. Navajos who reported exposure to uranium mine and mill wastes during the industry’s boom years – the 1940s through 1980s – were more than twice as likely to develop kidney disease as those with no self-reported exposures, according to studies led by Dr. Johnnye Lewis, a research professor at the University of New Mexico’s College of Pharmacy and co-director of the Center for Native American Environmental Health Equity Research. The studies also have found links between exposure to mine wastes and inflammation associated with cardiovascular disease. But no one yet can say whether the Red Water Pond Road community or those with similar exposures have elevated rates of cancer, asthma or other diseases because a comprehensive health study has never been conducted. Now Lewis is leading the first study to investigate the potential effects of the uranium waste on pregnant women and children. So far the results of the five-year Navajo Birth Cohort Study are preliminary; the findings have not yet been peer-reviewed or published. The tests of about 700 Navajo mothers and 200 babies show that the overall distribution of uranium concentrations in their urine is higher than that found in the general U.S. population. About 20 percent of them were particularly highly exposed, with concentrations higher than the 95th percentile found in a national survey. That means those Navajo exceeded the uranium of 95 percent of Americans overall. Also, all the babies studied had uranium in their system at birth, and their concentrations tended to increase through the first year of life. Dust in 85 percent of about 600 Navajo Nation homes tested contained uranium, along with arsenic, lead, manganese and other contaminants, according to researcher Chris Shuey. Now the team is trying to determine how much comes from mining waste versus natural sources since uranium is found naturally in the region’s soil. “Seeing so many homes with detectable uranium indicates how ubiquitous it is and how important it is for us to understand the potentially toxic concentrations, either alone or combined with the other metals we find, such as arsenic,” Lewis said. As researchers investigate the health impacts, Red Water Pond Road residents confront the uranium legacy every time they walk out the door. A few hundred yards away, two giant hills of tailings and mine waste are a perpetual reminder that the bulk of the cleanup work is still years away. Although a cleanup plan has been enacted for the community, progress here and elsewhere on the reservation will be slow, even in the best-case budget scenarios. The House Appropriations Committee has proposed a 2018 EPA budget that reduces the agency’s funding by $528 million, far less than the $2.6 billion cut sought by the Trump administration. The House bill also maintains current tribal grant spending and increases Superfund spending overall. But it cuts Superfund enforcement and operations by $18 million and it endorses the EPA’s plan to eliminate thousands of employees. EPA officials offered no answers, declining to provide information about how budget cuts will affect the Navajo cleanups and other programs. “Administrator Pruitt is committed to leading the EPA in a more effective, more focused, less costly way as we partner with states to fulfill the agency’s core mission,” an agency spokesman said. Pruitt has made it clear he wants to delegate more responsibilities to state and local governments for enforcement and cleanup. But Eric Jantz, an attorney with the New Mexico Environmental Law Center who represents the Red Water Pond Road community, said it’s “pure fantasy” for the EPA to shift greater responsibility to states and tribes while simultaneously slashing funding. And expediting cleanups without sufficient money or staff could lead to incomplete or substandard results. Tribes depend on support from EPA regional offices, particularly for expensive, complex operations like the Navajo Nation’s uranium remediation, said Cliff Villa, an environmental law professor at the University of New Mexico and former assistant regional counsel for the EPA. Udall also took issue with shifting decision-making to the states while simultaneously proposing big reductions to state and tribal aid. “If you take that federal support away, tribes and the state of New Mexico, for example, just do not have the resources to step in and fill the void,” he said. Her brother Tony explained that the Navajo system of kinship, or k’é, connects not only family but all living things as relatives, even the land itself. “These mesas, all the drainages where we live, where the trees are … we consider them holy,” he said. But for Tony and his wife, children and grandchildren, the waiting and worrying became too much. They accepted the EPA’s offer of assistance to relocate to manufactured homes several miles away. On a recent Sunday in June, Angie and her sister Stephanie returned with Tony and the children to visit the remnants of their doublewide mobile home.